How can you ‪#‎LightUpTheLOVE‬ today? The seventh emotional ingredient is “Unconditional Love.” And that includes you! Always do your best to treat yourself and others with love that is unconditional. What does unconditional love look like? If you are a pet owner you get to experience it every day. Watch how your pets love you without judgement of who you are, what you do or even how you treat them. Putting a condition on your acts of love and kindness turns it into a business deal and that’s not what love is about. Be your imperfectly perfect authentic self. This allows you to avoid judging yourself and others and helps remove the false belief for needing anyone else’s approval for your choices and actions. 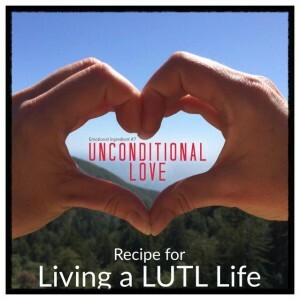 Shed your emotional armor and live a ‪#‎LUTL‬ life!